We strive to give each of our clients a quality bathtub refinishing service with a 100% satisfaction guarantee. 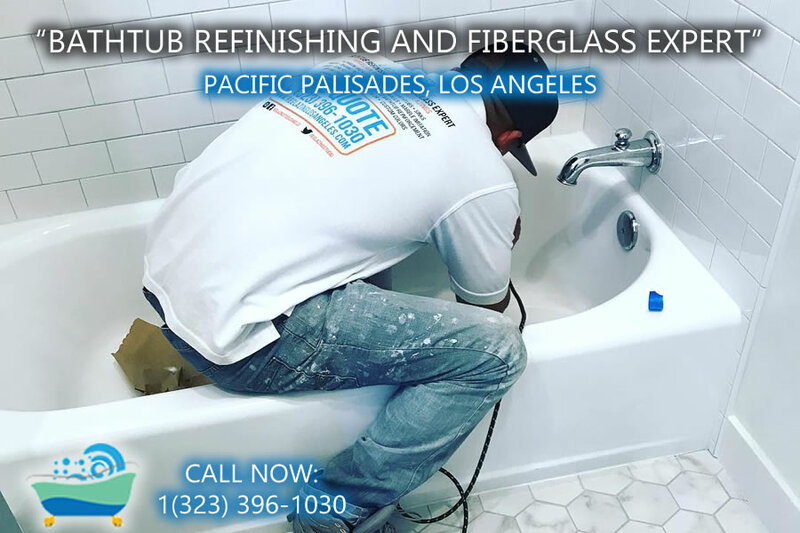 Our Pacific Palisades bathtub refinishing services provide superior bathroom porcelain and fiberglass refinishing combined with outstanding customer service to real estate properties, commercial property owners and homeowners throughout the Pacific Palisades area. Serving our customers in Pacific Palisades. We are committed to offering high quality reglazings, the latest technology fluorocarbon silicone technology as well as an experienced knowledge base for property managers in buildings (rental apartments or condo reglazing service) and homeowners that cannot be beat by our competitors in the area of Pacific Palisades in California. All of our customers have saved thousands of dollars and a great amount of time by refinishing their bathroom fixtures instead of replacing them. We serve our clientele in Pacific Palisades, porcelain bathtubs reglaze, fiberglass bathtubs showers reglazing, bathroom sink refinish, and kitchen and counter top reglazings. As bathroom sink reglazing or refinishing experts in the Pacific Palisades area we specialize in the refinishing of all kinds of porcelain sinks. We can repair all kinds of holes, chips, cracks, and rust that your sink may have. We are able to restore your bathroom sink to its original condition if you live in Pacific Palisades area. We also refinish kitchen sinks one bowl or double bowl. And tile counter tops reglazing in Pacific Palisades. 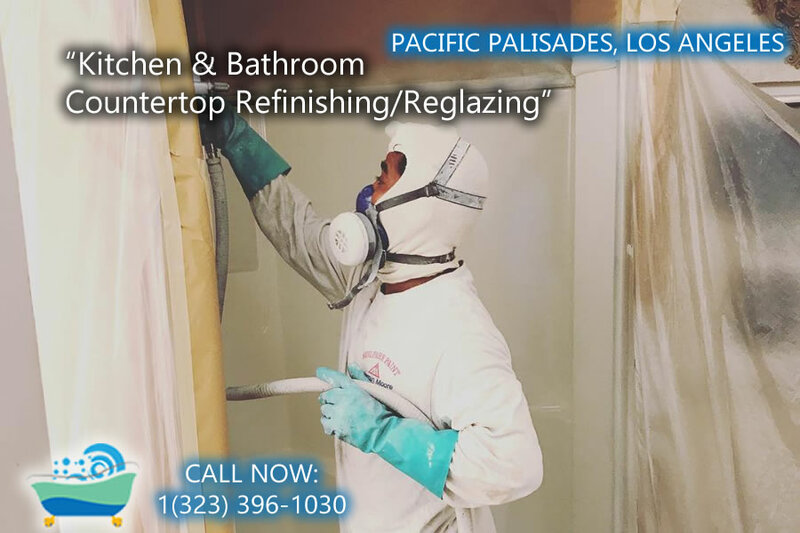 Reglazing Los Angeles is the most reliable, professional, and experienced bathtub refinishing company in the Pacific Palisades area. You will not be disappointed with our service. For sure, try one time, you will glad you did it. Our kitchen countertops tile and sink refinish in high quality the best coating made in America. No matter want you want to do want the property, rent, sell, or remodel for you. You will increase value at the time of sale or rent. Get in contact with us today. Call Now (323) 396-1030 or Email Us. Send your pictures or request a one time visit in your location for an inspection of the project. I will be happy to answer any questions that you may have in regards to our refinishing process, prices, products, quality, warranty, and life of reglaze. Our reglazing services is driven by integrity and honesty to our clientele. We focus in bringing a quality and affordable bathtub and tile refinishing service to all of our customers in the Pacific Palisades area. We have worked with thousands of residential homeowners, hotel and apartment managers, building supervisors, city inspectors in the past years to find the way how to improve and make a better refinish service. We have been able to satisfy their refinishing needs 100%, and we have saved them thousands of dollars in bathroom and kitchen sink and tile remodeling, our fluorocarbon silicone technology is the right solution for any project where other reglazers can not achieve. We specialize in kitchen and bathroom ceramic tile refinishing/reglazing serving all Pacific Palisades customers. Our technicians will do a high quality reglaze bright white color coating or any other color you want to match. Kitchen tile counter tops resurfacing, recolor full service. We reglaze tiles, formica and marble imitation. Our chemistry can long last up to 5-20 years. Increase the rent monthly or value of the property by reglazing and spending less instead of replacing the countertop in your kitchen or bathroom. The process can save you money and time on resurfacings tile projects, and will extend the useful life of your kitchen or bathroom countertop. 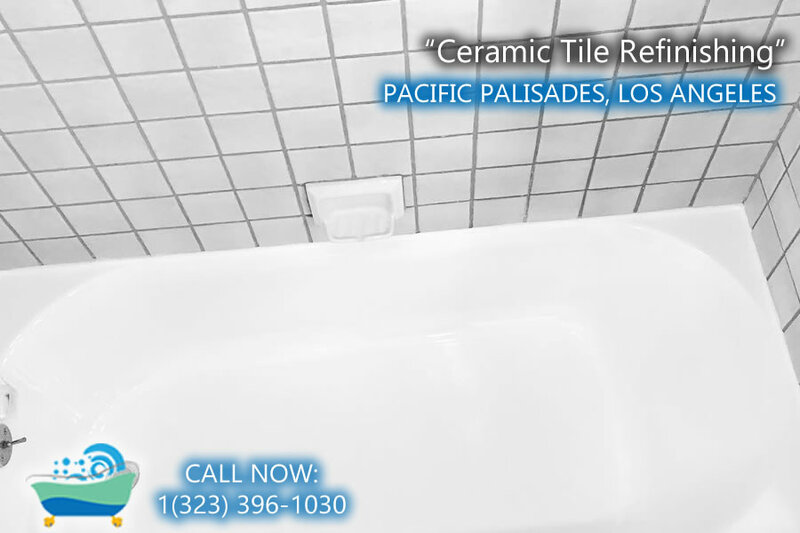 Pacific Palisades Ceramic tile refinishing is an affordable alternative to tearing out and replacing your ceramic tile. Tile refinishing is not just painting the tile as it involves a complete preparation, bonding, and adhesion of the topcoat. We apply two parts acrylic fluorocarbon silicone when you refinish your ceramic tile, it will have a high gloss and beautiful refinish that can long last for more time. We don’t care competitors, we follow carefully our chemistry. We can refinish all ceramic tile found in bathrooms and counters for a residential home or apartment in Pacific Palisades California. The most commonly refinished tile is the three walls side of tile around the bathtub and a porcelain tub enclosed. We also refinish tile in showers, vanities, and bathroom floors and walls in Pacific Palisades area. Whether you want to change the color of your tile from pink to a white color or a more modern color, or just want to spruce up your bathroom by giving your ceramic tile a new fresh high glossy white finish. We are the solution to resurface your tiles and make your bathroom or kitchen like new again in Pacific Palisades CA. Ceramic tile refinishing company or reglazing experts are here to help you through the entire chemical process and the technology we use. We will offer affordable prices, reglaze in white color or we can help you select the right color, and provide the best refinishing service you can find in Pacific Palisades reglazer providers. We will also answer any questions that may arise before, during, and after the process is finished done by our technicians. Call for free quote in Pacific Palisades (323) 396-1030. We will do the best to make the best refinish for your project. You will be glad you did it. Pacific Palisades tile Refinishing Helps Maintain Grout Lines Clean when you renish more frequently for a rent or short sell property. Ceramic tile refinishing is also a great way to eliminate nasty and moldy caulk and grout lines on the tile walls and edges for customers. For sure these areas tend to have a porous nature, thus all dirt is easily accumulated over time and use. Refinishing the tiles solves this problem as it seals all caulk and grout lines. Your tile will still have the look and feel of regular ceramic tile like new condition again. Call us now at (323) 396-1030 to inquire about our tile refinishing service and to request a free quote! What type of finish is applied on the kitchen and bathroom countertops? Our experts will apply a durable acrylic polyurethane two parts reinforced with fluorocarbon silicone finish when refinishing bathroom and kitchen tile, formica or marble imitation countertops. This finish is of the highest quality and technology in kitchen and bathroom countertop refinishing we had found in the USA. No other competitors handly this technology in California, require to properly mix quantity and induction time allow the molecules mix together. Our research indicate that some providers purchase cheapest epoxies and spray them on most projects with no induction time and the result is a substandard refinish, the reason why will peel the reglaze in less than 1-2 years. What type of countertops can be refinished for a Local customer in Pacific Palisades? Almost all kinds of kitchen and bathroom countertop materials can be refinished by our technicians. The materials that can be refinished include laminate, cultured marble imitation, ceramic tile, and formica countertops for kitchens and bathrooms. We also offer a free in-home consultation for your kitchen and bathroom countertop refinishing project. Just email us or request a job from our website and send some pictures. We will be able to quote you as soon as possible. For a complex project we will need dimensions in square feets. A visit to your location will be requested to properly quote your project. For further information on our countertop refinishing, please call the office at (323) 396-1030. Black, moldy or stained grout lines on the tile walls (we remove old caulking and add a new and fresh GE Silicone Caulking.